Are you ready to see how the Microsoft cloud changes everything? 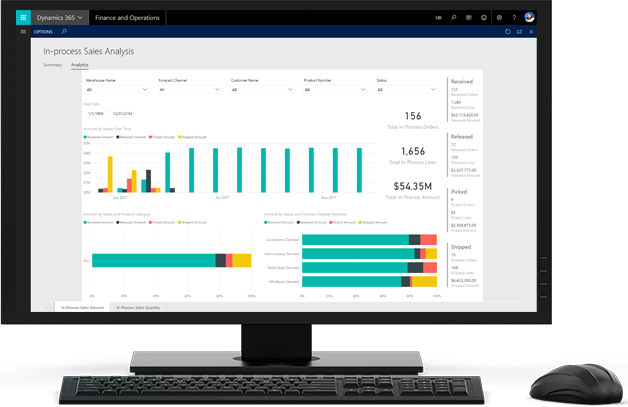 Inside, you can explore the breadth of Microsoft Dynamics 365. From high level guided tours, to industry-specific demos for consumer brands, manufactures, and retailers, you've come to the right place. You'll see what the core solution has to offer, and get a taste of the enhancements added on top with Sunrise 365® industry extensions. We'd love for you to join us if you're ready to see more! Is this a fit for your company? Companies that manufacture, distribute, and or retail products like apparel, footwear, furnishings, cosmetics, accessories, textiles, or equipment in various channels and global regions will find this resource helpful. Is this a fit for your role? If you're in IT, Finance, Sales, Supply Chain, or Customer Service and you're evaluating cloud business applications like ERP, CRM, POS, SCM, WMS, and Business intelligence, then you will find relevant resources inside. Is this a fit for the long term? Many companies are choosing Microsoft Dynamics 365 to replace and consolidate legacy systems. It can future-proof your organization for a lifetime and it will stay fresh with the latest functionality. When a generic demo of Dynamics 365 won't do and you need to see something specifically geared towards consumer brands, manufactures, and retailers, you've come to the right place. You have unique industry challenges—and frankly, we've got the know-how, experience, and Sunrise 365® industry extensions you need. We'd love for you to join us if you're ready to see more! Dynamics 365. Sunrise also provides exclusive extensions and capabilities in key industries – apparel, footwear, consumer goods, and home furnishing companies with manufacturing, distribution, and/or retail operations. Let us help you implement your great ideas today.